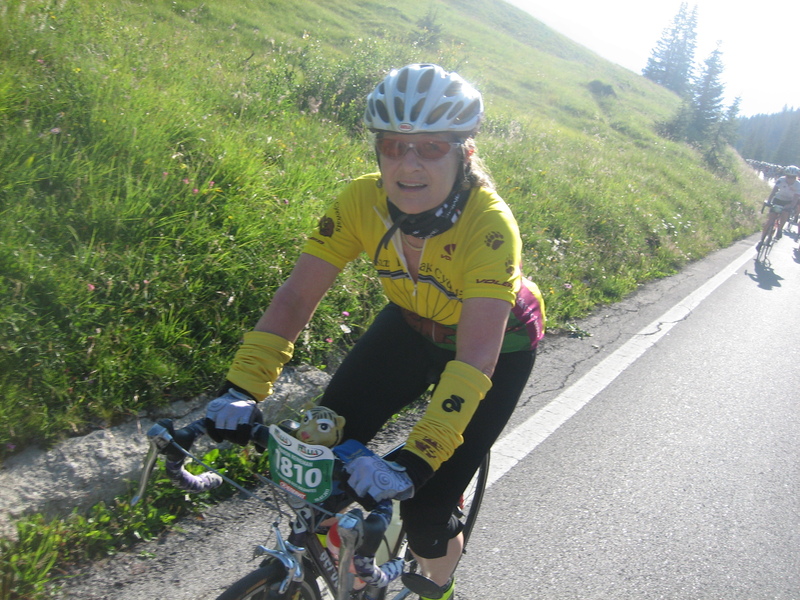 I haven’t written in a few days, over the weekend, during which Sherie and I spent in Corvara for the Maratona dles Dolomities weekend festivities. 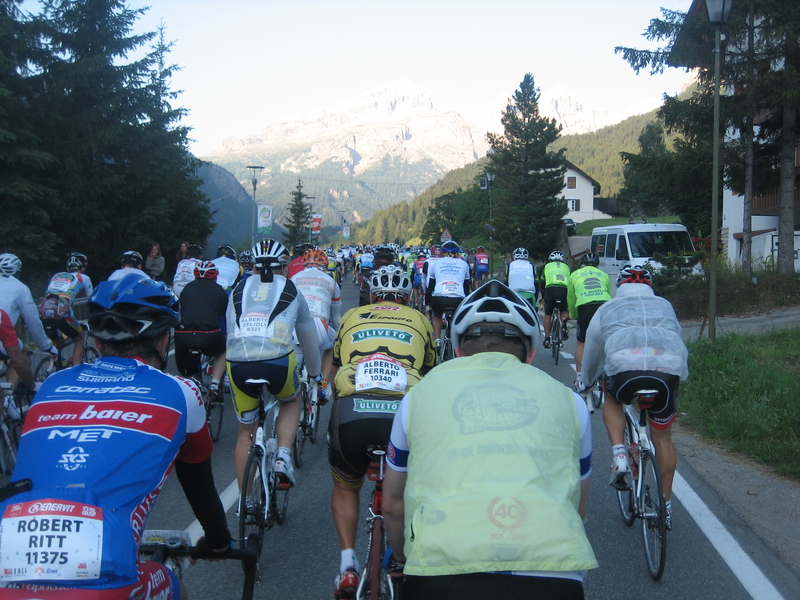 The photo record to is a bit spotty for Sunday, as Ben was busy being a participant/competitor and did not feel too comfortable holding the camera while riding in tight spaces in the kilometers long peleton that is the Maratona. On Sunday, Coach Ben told Athlete Sherie we needed to rest after the Selle Ronde of the day before, to prepare our legs and energy levels. So Saturday morning we strolled into town and the finishing area of the race. Dozens of workers were erecting barriers along the street, hanging banners, and assembling various structures at and near the Ice Stadium. The area was closed to the public. 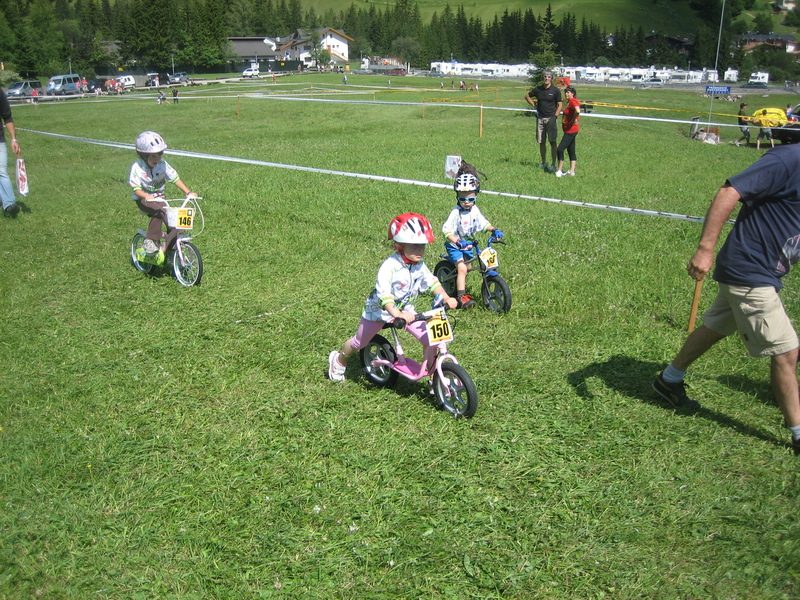 However, in the adjoining meadow, a looping course was marked off in tape for the children’s races. An energetic announcer engaged the crowd and racers, holding four age group races of various distances. 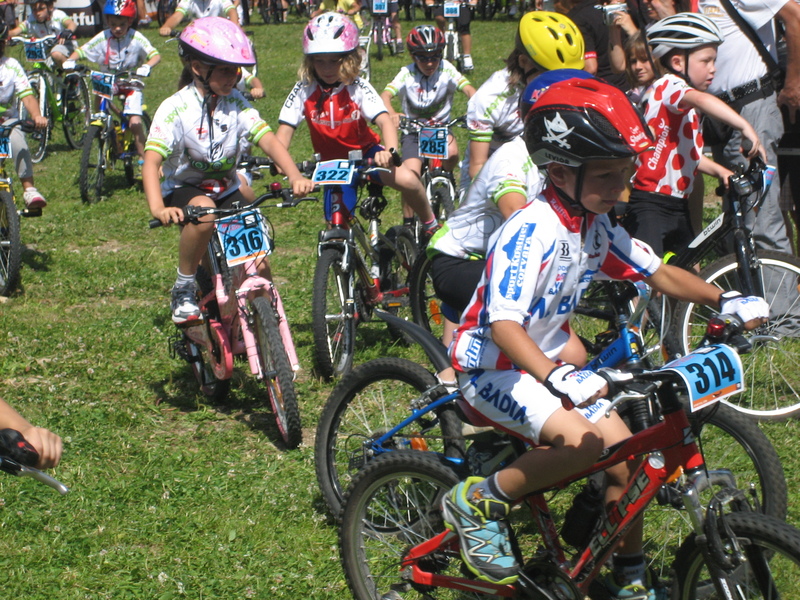 Kids on all kinds of bikes, from walking bikes to BMX to towny to mountain to road bikes, rode with various levels of intensity behind the adult lead out riders. Parents and siblings cheered. The announcer blared ever faster Italian, in higher and higher pitch, over the loudspeakers. It was a great time sharing the enthusiasm had by the people for bike racing. After a lunch purchased in the local market and consumed in our room, we rested the afternoon away. We prepared our bikes and kits for the race. At dinner, our hosts in the albergo told us they would open breakfast at 4AM for the racers, and asked if we wanted a plate of pasta for breakfast! Truly going out of the way to help us. Race day began before dawn, many rising early to prepare. Cooks to feed the us, various police to control the traffic and close the roads as needed, entertainers and musicians, course marshals, racers and their loved ones. Sherie and I were at breakfast before 4:30, dressed and ready to ride to the race start (6 km downhill) by 5:15. At 5:15, it is just light enough to ride without lights, and we joined the parade of cyclists, and a few trucks and cars, to go to the race start in La Villa. At 6:30 the race was to start. Ben took off his jacket (the first 12 km are uphill), and within a minute we were moving! False alarm, though, as we only moved up the main road very slowly a few blocks to queue up as other groups moved onto the course. Sherie, being female, was drawn into the second group; Ben, being a first-time man was drawn into the last. So Ben estimates there were about 7000 riders in front of him; having arrived early he was in the first few hundred riders of his group. Some moved around the queue onto the sidewalks and driveways trying to squeeze further forward as we waited. When Ben stood on his tip-toes he could see what seemed an endless stream of riders a hundred meters ahead moving off the side street and turning under the starting banner. Finally Ben was moving. I crossed the start timer/banner at 6:48 AM. 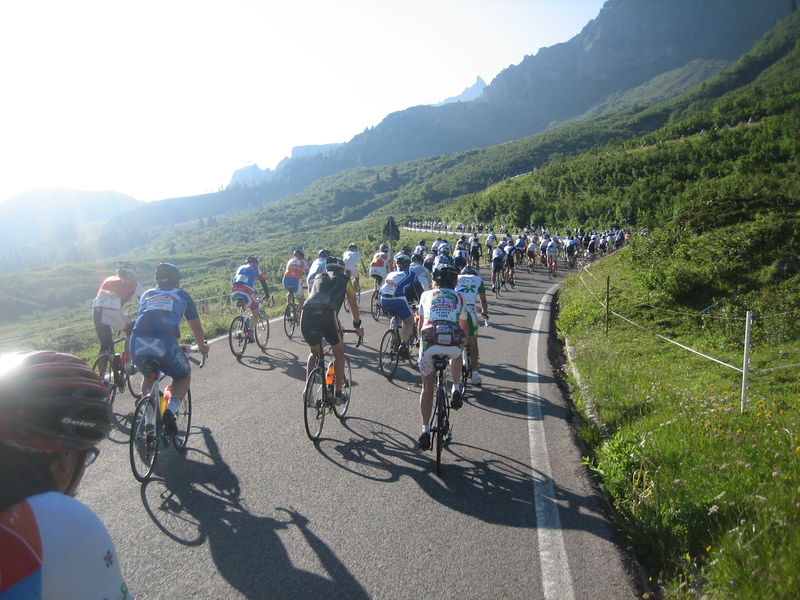 (I would leave my bike odometer on the clock setting most of the day, as I knew I needed to be at the cutoff to Passo Giau at 11:40 to be allowed onto the longest course.) Anyway, it was curb-to-curb bike in various speeds and levels of control at the start. One’s pace was limited to whatever the person in front was doing, although some lines moved faster than others. The trick was to find a line of riders going uphill at the desired pace, stay with them dodging side-by-side groups and people changing lines. 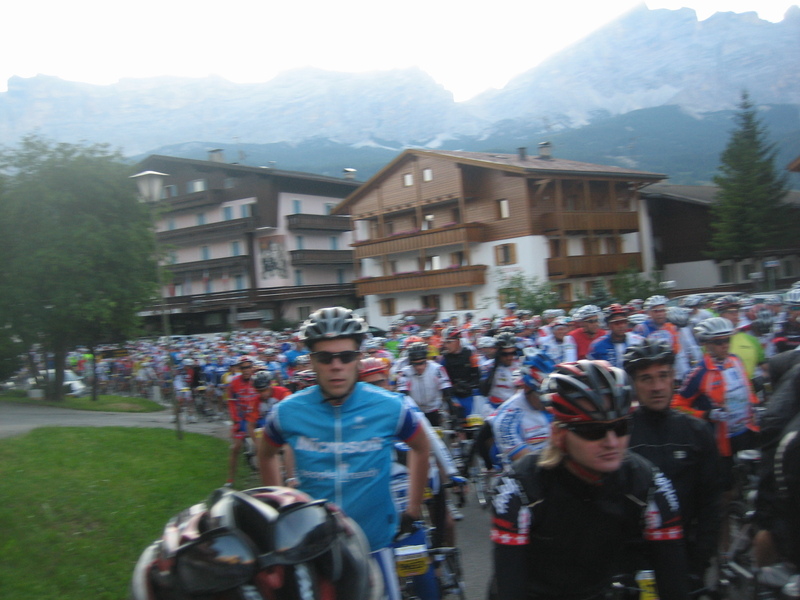 I really couldn’t get into my own rhythm at all the 6 km to Corvara. When the road steepens in Corvara to ascend Passo Campolongo, it was a tiny bit better. The cheering spectators behind the barriers helped one’s momenturm through town. However, the course was such that one needed to spurt for a few pedals turns through a gap of slow riders, then recover a bit, and repeat. Every 50 meters for about 5 km. However, Ben saw only one bike collision all day, much later, although he spent considerable time keeping his front wheel clear of the various slower bikes ahead. And once Ben received a firm fore arm to the chest when he moved to his left to pass a slow rider, but overlapped the wheel of a person who was trying to overtake him on his left. After a pretty quick descent off Campolongo, that went more politely in formation than Ben feared, we started uphill again in Arraba to climb Passo Pordoi. Again, curb to curb without much space to spare, for many kms ahead and beind, a stream of bikes flowed uphill. So off I went, the 15 km or whatever of 6% grade up pass the ski lifts and cow pastures. Finally there was a bit more room and one could settle a bit better into a rhythm, only needing to slow or sprint occasionally for traffic. Because the roads were closed to traffic (I guess some kind of rolling road closures as the wave of cyclits moved), one could use both lanes of the road. It was great to ride without the intermittent buzz of racing sport motorcycles, or the steady stream of diesel exhaust, that one would normally experience on these roads. Ben used the whole road too; I like the option of taking the long way around each switchback to minimize the grade, trading a few meters of distance for those same meters of eased pitch. On the slopes of Pordoi Ben was greeted by Jeff(?) from Alameda and the Berkeley Bike Club, who rode along with a few friends. We chatted about our Italian vacation plans, and they passed me, although I did catch up again with Jeff later. (Apologies if the name is wrong, as remembering names is a weakness of mine.) Ben shared a few words with others too, with other Californians and Americans and a few Brits who took my California jersey as the invitation to speak English that it was meant to be. There were few porta-potties. I guess they were only used by women and men in more serious need. Ben used the meadows. There were not many bike racks, although a few barriers were set up upon which to lean ones bike, alongside the permanent fences, etc. There is not a great need for bike racks, as “serious” riders stay astride their fancy carbon bikes and moved right up to the feeding tables. Hence it is really difficult to queue up and move at the feeding tables. Local favorites are bananas cut in half, half sandwiches of kaiser rolls and speck, and the sponsor’s chocolate wafer cookies. Ben stayed away from the lemon slices (for water?) but did taste a few sour orange wedges. There is often some live (and loud) entertainment going on. Drummers, bands, accordionists, recorded music galore was played to keep the energy flowing. 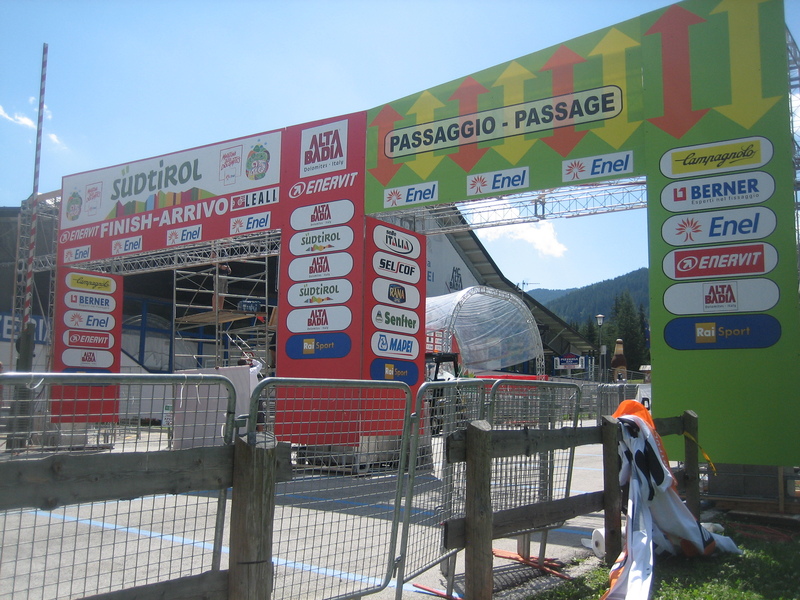 While the Maratona organizers pleaded with people to not litter, the km or so past each rest stop was strewn with gel, candy, and energy bar wrappers. Along with bananas, peel or whole, squished to various degrees as if in some slapstick cartoon. Ben climbed the steeper Sella well, and descended towards Passo Gardena fairly carefully. The TV helicopter moved above and below the ridges, here and elsewhere on the course. (Sherie and I were too tired later to look for the TV coverage.) On the one flat km traverse, I reached into my pocket for the baggie of plums, figs, and other dried fruit I had packed, munching until the climb began again. From this point in the ride on, I had sticky shifters on the bike, as the juicy plum had squished all over and the dried fruit was coated with a gooey mess. However, the calories stood me well later in the day. Ben climbed and descended Passo Gardena uneventfully, coming into Corvara. If memory serves me correctly, it was about 10 AM as I entered the barriers lining the street and rode through the “passage” chute of the finish line. I was entering the second loop for the middle and longer course, which first climbed Passo Campolongo a second time before moving toward the bigger passes. The crowd did not thin appreciably on this second time up the Campo, although there was enough room to pick one’s own pace and hold it. The refreshment stop at the top was especially anarchic, as it seemed every Pinarello in Italy was blockading the food tables. But, with two full bottles and some bananas, Ben was soon descending toward Arraba, this time to turn left down valley. The road down the valley is the only extended flatter section of the course. Here some pace lines formed and broke, as people alternated snacking with moving quickly. Ben had the sense to draft the only tandem he had seen in the race for a couple km, until he eased past them climbing a small hill. They spoke French, and did not respond to my greeting in English. One more fluid replenishment at a rest stop, then on to the very beautiful mountain-side villages below the western approach to Passo Giau. As noted in an earlier entry, the Giau is a beast, a real stiff climb from the get go. The sun was merciless on the hot pavement; Ben’s handlebar temp in the sun showed over 30C. With the work, the conversations around all ceased, and one could hear the occasional creak from a bike, the call of the birds in the trees, and the gurgle of the stream as the road repeatedly bridged it switching back across the mountainside. 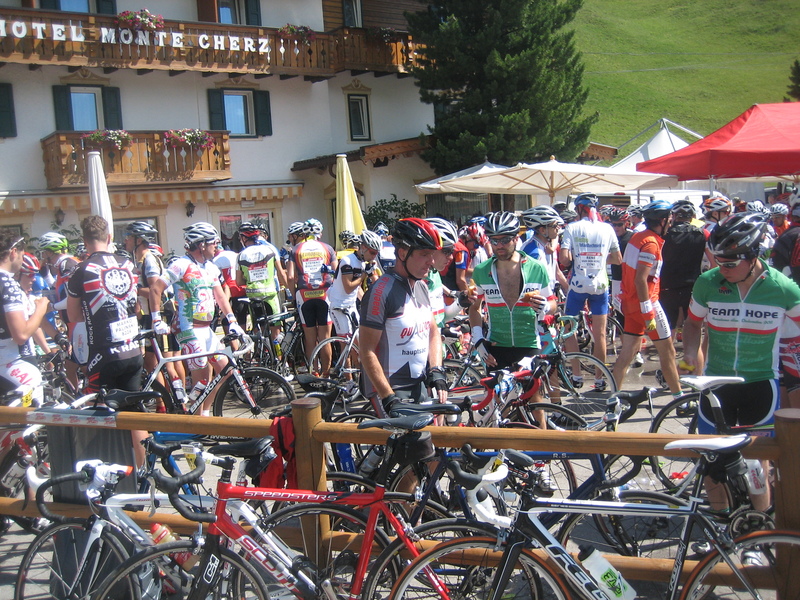 People were stopping to rest in the few shaded places; some got off their bikes and walked (with 5 km to go!) up the steady 10% grade. Ben plugged away slowly (8 kph) and steadily, standing at times to stretch out the tightening back muscles. The avalanche tunnels provided the best cooling spots in the middle sections. (How slowly can one ride for 100 meters of shade?) Above that some breezes cooled us (became a steady wind at the pass) and many cheered when the first cloud of the day briefly shaded the road. Ben calculates it was 70 minutes of climbing for him to ascend Giau. More e-drinks at the pass for Ben, and a half-sandwich, and he was off to cool on the descent of the east side toward Pocol and Cortina. 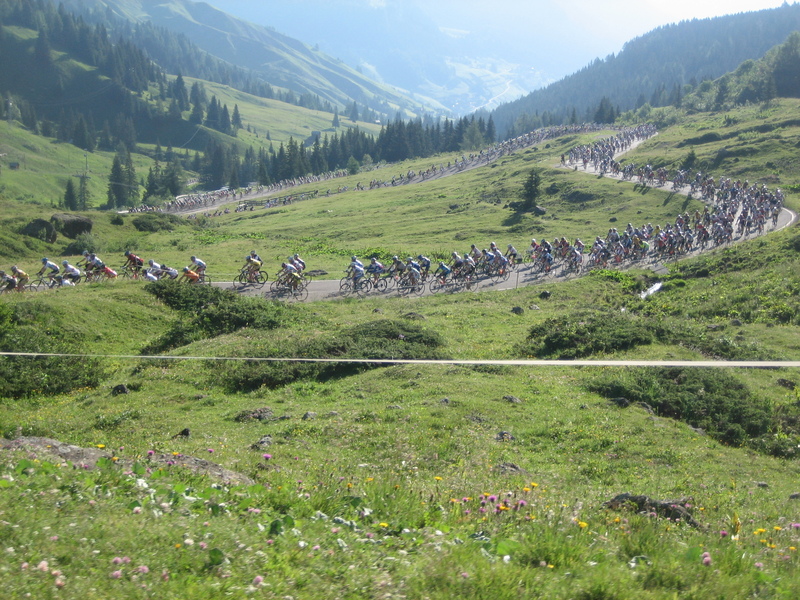 It was a really great descent; the road has wonderfully banked hairpins of constant radii, and the cyclists stayed in formation at a good clip. One could truely use the whole width of the road, taking the wide to inside to wide line, braking into the turn, leaning into the apex and releasing the brakes to let gravity accelerate the bike in the steepness of the apex onto the next straight. This goes on for many kms, until a flatter section prefaces the turn up onto the climb of the east side of Falzarego. The grade on Falzarego is not bad, mostly 6% to start, then a flat section where Ben could use his middle ring and snack some from his pockets, then a steady 8% for the last km or so. Ben passed many here; I guess the calories and drink consumed allowed him to keep up his pace while many others faded. One last drink stop at Passo Falzarego before the short but sharp climb to its sister pass Valparolla. Ben felt strong, I guess the smell of the finish, and all the sugar consumed, had him raring to go. When the legs starting feeling dead on the climb, Ben stood to continue. Still it seemed too hard. But then I looked down at the rear cluster, and noticed that I had left the bike in second gear, and ridden the better part of the last 10% grade without using my 28 tooth sprocket. Sugar rush, but brainless! Again an orderly descent, cyclists mostly in formation at 50 kph plus. Once we turned at La Villa to go back uphill to Corvara, many cyclists were riding in toward us on the left, back from the finish (still no cars, thankfully.) Many racers on the way to the finish were spinning slowly up the 2% to 4% grade; Ben joined two others in a pace line into the wind to power pass many. 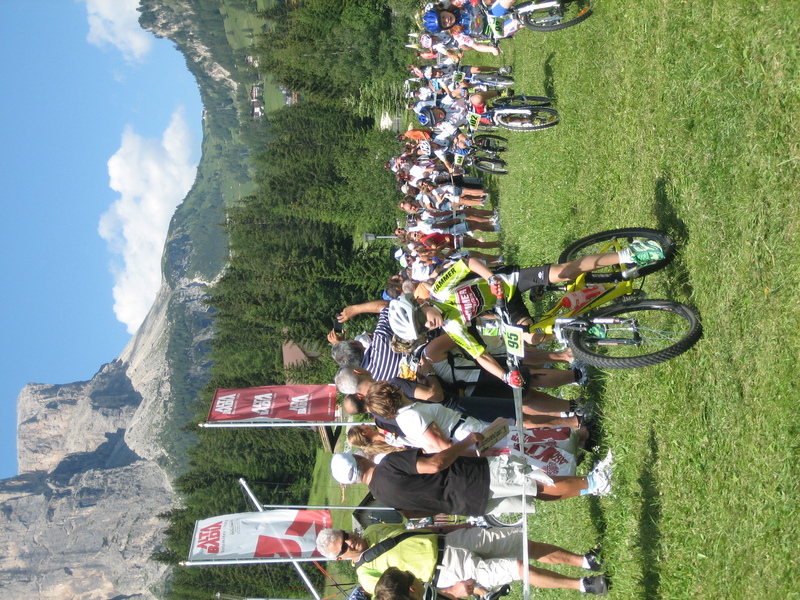 We traded pulls all the way to Corvara, where Ben dropped off the back not able to hold on as they upped the pace for the barriers through the turns toward the finishing ramp. 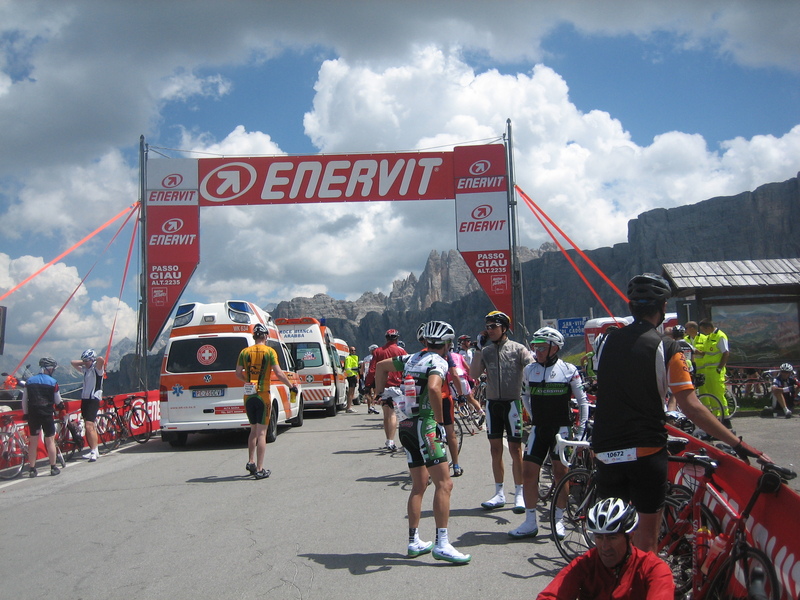 However, I did pass a few more cyclists before crossing the finish banner, this time on the Arrivo side. I had entered the finish chute, where kids cut the number from my bike, exchanged it for a hat (instead of the offered 10 Euro deposit), and gave me a medal and soda recovery drink. As I left the chute, I entered a giant party, much like a music festival. Throngs filled all spaces, many still with bikes under them, as they sipped Warsteiner Bier and munched food. I walked around the ice stadium to the place on the soccer field which Sherie and I had appointed our rendezvous spot, and there she was! (I was so thankful we had earlier arranged a spot to meet.) Sherie, wearing her hat and medal, was beaming with satisfaction, partly brought on by the half-eaten chop and pasta, and half consumed bier. She was thrilled to see me, chatting about her experience as I cooled off with my soda, still hot and psyched from the exertions of the last push into the stadium. Soon she led me into the ice stadium itself, a cavern of noise with a thousand people talking, drummers drumming, and barkers barking. I exchanged my coupons for pasta and bier (I had already eaten half of Sherie’s pork chop.) Sherie exchanged coupons for our vests, and stayed inside to watch the entertainment while Ben retired outside to the relative quiet of the soccer field and only crowded benches. Transport and lodging aside, the 70 Euro spent by each for the ride is well rewarded with swag. Besides the ride support, timing, and facilities befitting the Giro, one received a jersey, vest, and hat commemorating the 25th anniversary of the race. Not to mention, bottle, munchies, wine, and a medal. At home, the clothes alone would cost that much. Ben could not eat all the post-ride food offered with his free coupons, having munched much on the course. When Sherie asked to leave, as she was tired, Ben was relieved that he did not need to ask first. We walked our bikes through the crowd to the main road, then down the ski/bike trail underpass to pass under the still barricade main road so we could ride the two blocks to our hotel. Showers and naps were in order, and then dinner at the hotel. Some conversation with other racers, although our next-table mates who had been our logistics coaches had already left to drive home to Tuscany. Luigi, the old master of 74, had apparently done the long course in six hours (to Ben’s eight – winner in something less than four and a half.) I crashed early, leaving dinner before dessert as Sherie had the stamina to stay awake a bit for conversation after Ben had gone upstairs. Nice going to both of you. Now I’m sorry I didn’t ride Paso Giau. I remember the other climbs, though, from this year and from three years ago. Well done to both of you! Truely an accomplishment to be proud of. Congratulation to BEN and SHERIE !!! We were pooooped just reading about it . Glad for you that it was a GREAT VACTION and experince. You tweo did Great in your races !! !